Young Camille befriends a strange visitor to his small town, and one day he brings this man a gift of bright, beautiful sunflowers. The man is the artist Vincent van Gogh, and the sunflowers quickly become the subject of a magnificent painting — one of many with sunflowers as the subject. Unfortunately, not everyone appreciates the genius of Camille’s "Sunflower Man," and Vincent is forced to leave the town. 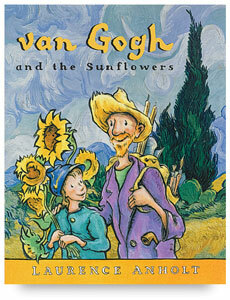 Van Gogh and the Sunflowers is a classic tale about acceptance of those who are different. Complete with reproductions of van Gogh’s work, this is another inspirational story from Laurence Anholt’s bestselling series, celebrating some of the world’s greatest artists and the real children who knew them. Laurence Anholt is a British writer and illustrator whose books for children include Cézanne and the Apple Boy, Leonardo and the Flying Boy, and Picasso and the Girl with a Ponytail . Anholt’s popular books for children have been published in 15 different languages, including Cantonese, Hebrew, and Icelandic. As both an author and an accomplished illustrator, he has created a charming series of children’s stories about famous artists. He and his wife, Catherine, both successful authors of juvenile titles, have three children, from whom they obtain many of their story ideas. They live and work in Lyme Regis, Dorset, England.